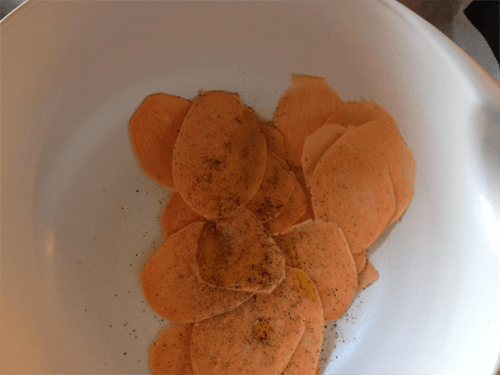 It is so easy to make guilt-free and tasty chips so you can indulge in a nice snack during a movie. The ingredients below make an average of a big bowl of chips.You can put as many or little vegetables as you prefer. Firstly preheat the oven at 200 degrees Celsius (around 400 F) and grab a baking tray with nonstick baking paper. Then clean your potatoes and peel them. After you’ve peeled them, slice them very thinly, I use a kitchen machine but you could use a mandolin or when you have patience, a knife! Place the slices in a mixing bowl and add some olive oil or coconut oil. I choose olive oil because I like the taste of it, but coconut oil is better with the oven heat. The chips just need to be just lightly covered and then you add some salt/pepper chili flakes or whatever herbs you like! Once you’ve sliced the vegetables, spread them out on a paper towel and put another paper towel on top of the slices and press. The kitchen towel will help absorb the moist out of the vegetables. Then put the vegetables in a bowl and add some coconut oil. When the slices are covered you can add salt/pepper and if you like some chili flakes. Place the ‘chips’on a baking tray, separating the chips to avoid any steaming. Bake them in an oven of 180 degrees for about 10- 20 minutes. The chips should curl up a bit on the side. When you take them out of the oven, let them cool off on a rack. The more they cool, the crispier they become! Enjoy this guilt-free and healthy snack!